Sardinian culture, traditions, art, people, food and wine tasting. 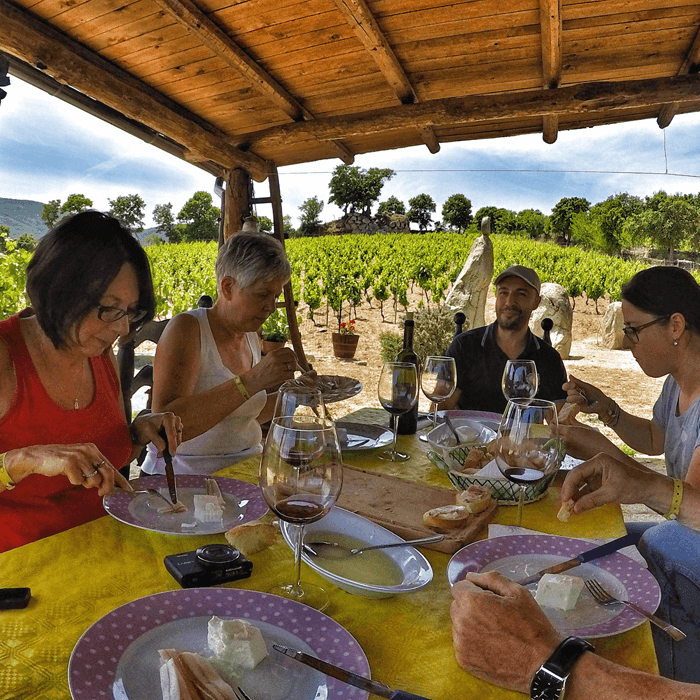 Cannonau wine, Mamuthones performances, local artisan and artist workshops, and a town covered with amazing murales. A wonderful day of explorations during which you will discover a piece of authentic Barbagia, its story, its people and its flavours. We run the Barbagia exploration tour every Tuesday, with the pick-up of tour participants at their hotel at 8.30AM, and dropping them back at their hotels at 6.30PM after a full day of Barbagia explorations. 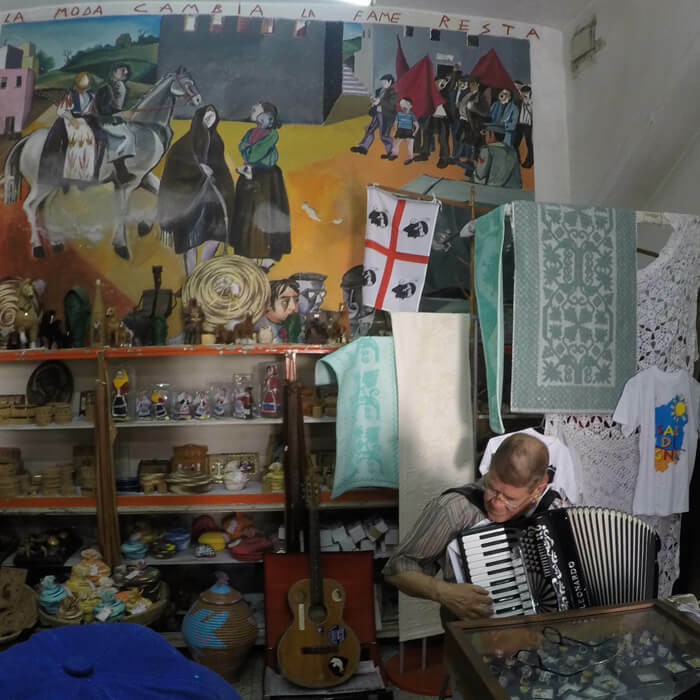 We will begin our Barbagia tour visiting the unique Museum of Mediterranean Masks in Mamoiada, home to the traditional folkloristic figure of the Mamuthones and the Issohadores, mysterious masked characters whose origins date back to pre-Christian pagan rituals. Today Mamuthones are artistically enacted by collectives of performers wearing monstrous characters masks with black painted faces and thick animal furs, and carrying heavy cattle bells hanging from their bodies, mainly for the Carnival, but also year round at several folkloristic local events. 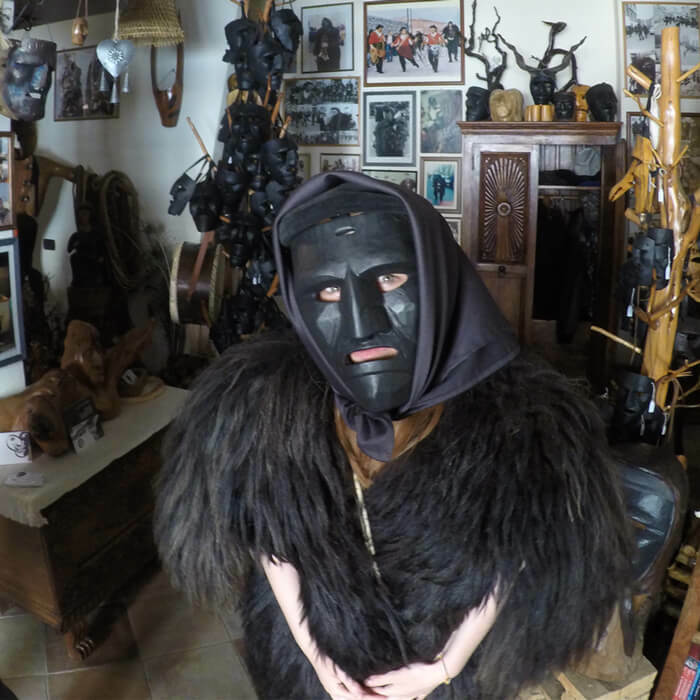 In Mamoiada we will visit a traditional Mamuthone craftshop where a local artist create mystic black masks for the Mamuthones characters, and we’ll meet the historic president of one of the famous local groups of Mamuthones. We will then walk to the small local cheese shop Badu Orgolesu to taste some delicious local Sardinian cheese, that is also possible to buy directly from the producers, if interested. 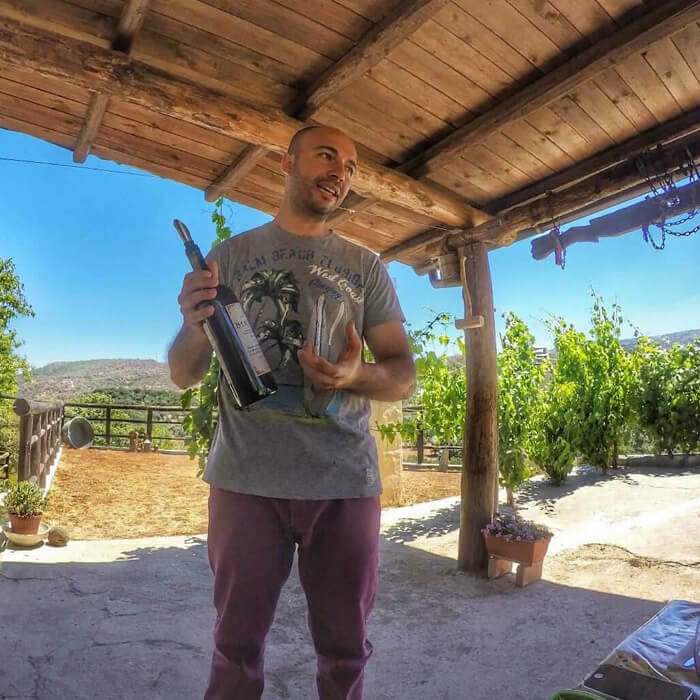 Right after the cheese tasting we will visit a small local vineyard with its own nuraghe, where we will enjoy Cannonau wine tasting while having a delicious lunch in a vineyard terrace, meeting the owner Luca who will tell us the story and the secret of his family’s centuries old wine making tradition. Then we will proceed to Orgosolo, heart of wild Barbagia and famous from bandits and murales, where we’ll discover the history of its famous murales by visiting local artists studios and getting to know the creators of the beautiful murales. 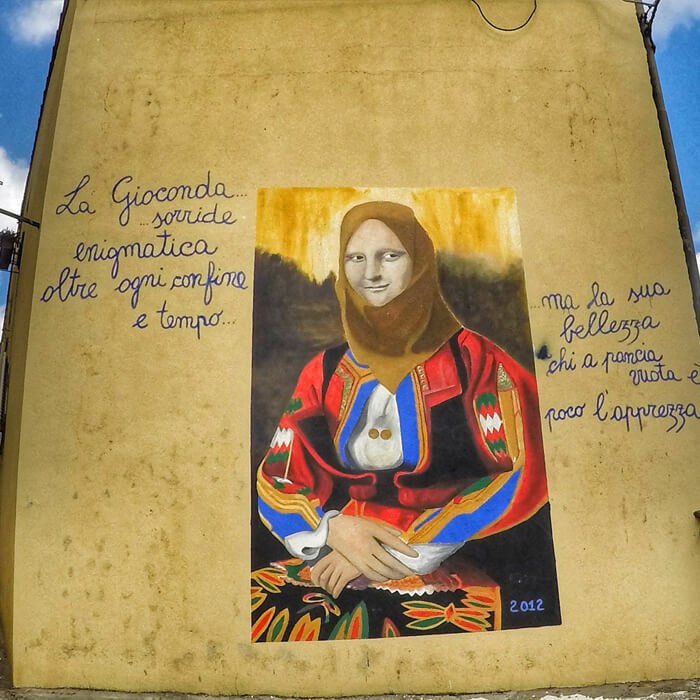 We will meet Teresa, a murales painter, and then we will walk through the city, I will tell you the story of the murales’ tradition and guide you through the best artwork featured on Orgosolo’s walls. During our Orgosolo walk we will also meet Nicolò Giuseppe Rubanu, founder of the Rubanu Group of Tenor Singers, and author of many songs and poems. The tenors from Orgosolo become famous for their opera lyrics about contemporary political issues, and were also the first tenors group in Sardinia mixing traditional opera singing with jazz music, working with established jazz musicians such as Marcello Melis, Enrico Rava, Rosweld Rudd and Don Moye. Tour highlights: Mamoiada, Museum of Mediterranean Masks, local Sardinian cheese tasting, visit a workshop of a local Mamuthones craftsman, wine tasting and a delicious familiar lunch in a lovely Mamoiada vineyard with its own nuraghe, Orgosolo, Orgosolo murales, guided walking tour with local Orgosolo murales artist, meet more local artists and musicians. Suggestions for this tour: Wear good walking shoes (no open shoes, sandals or flip-flops) and comfortable clothes. Bring also one bottle of 1.5 lts. drinking water per person, and sun protection. We loved taking Andrea on an authentic Barbagia tour! 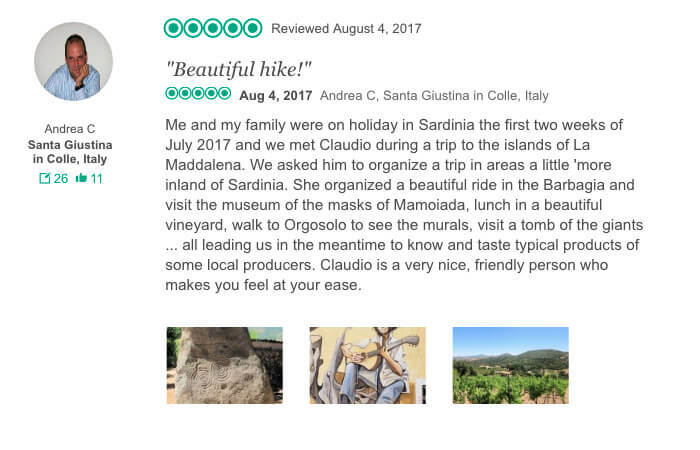 Read what he said on his great review on Tripadvisor about his Sardinian Slow Experience with our Gallura and Costa Smeralda Tour.